Choose from Case Bingo Paper and Bingo Paper Booklets in a range of cuts and colors. Each box of Case Bingo Paper has 9,000 total faces. Our Case Bingo Paper is available with the following number of faces (“Ons”) per individual sheet: 1 On, 2 On, 3 On, 4 On, and 6 On, in both horizontal and vertical styles. Case Paper comes in the 1-9,000 face number series (call 1-800-233-0828 for other series). Bingo Booklets are available in 3 On and 6 On Vertical Bingo Paper cuts, and the booklets feature 10 sheets per book with the standard color rotation. Each Bingo Paper Booklet features these colors (listed from the top Bingo Paper sheet to the bottom booklet sheet): blue, orange, green, yellow, pink, gray, olive, red, purple, and brown. Bingo Booklets feature the 9-18,000 face number series. Please visit the Bingo Paper pages below to learn more about a particular type of Bingo Paper. 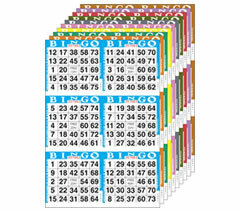 For additional information on our Bingo Paper or any of our Bingo Supplies, please contact us at 1-800-233-0828. 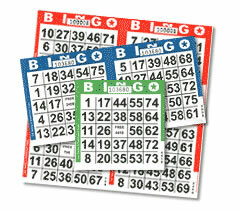 Looking for other Bingo Supplies for conducting your game? Browse our selection of Bingo Chips, Daubers, and Accessories, Table Top Bingo Blowers, Bingo Sets for Small Groups, Bingo Consoles and Flashboards, and other Bingo Supplies.